← What Should Democrats Look for in a Candidate? Congresswoman Tulsi Gabbard certainly excites strong emotions. Some pro-peace progressives responded rapturously when the Hawaii Democrat announced her candidacy for President. Centrist and establishment Democrats rushed to denounce her as a racist homophobic consorter with tyrants. While there is dissent among American Muslims, it appears that many consider her to be an Islamophobe and oppose her candidacy. Determining why Gabbard’s announcement widened schisms among the always fractious Democratic coalition is instructive and not too difficult to discern. The very reasons that many progressives strongly support Tulsi are precisely why establishment Democrats vehemently oppose her. This dynamic is causing many progressives to ignore or elide legitimate questions about Tulsi. These include: A disappointingly ambiguous statement in 2014 on torture. Her vote in 2015 to impose additional restrictions on refugees fleeing war torn Syria. The precise nature of her ongoing relationship with Indian Prime Minister Narendra Modi, who has overseen a recent crackdown on Indian Muslims. Her refusal to condemn the use of armed drones in the Middle East. On the other hand, centrist Democrats are dismissive of the fact that the great majority of Tulsi’s problematic votes and statements all occurred four or more years ago. 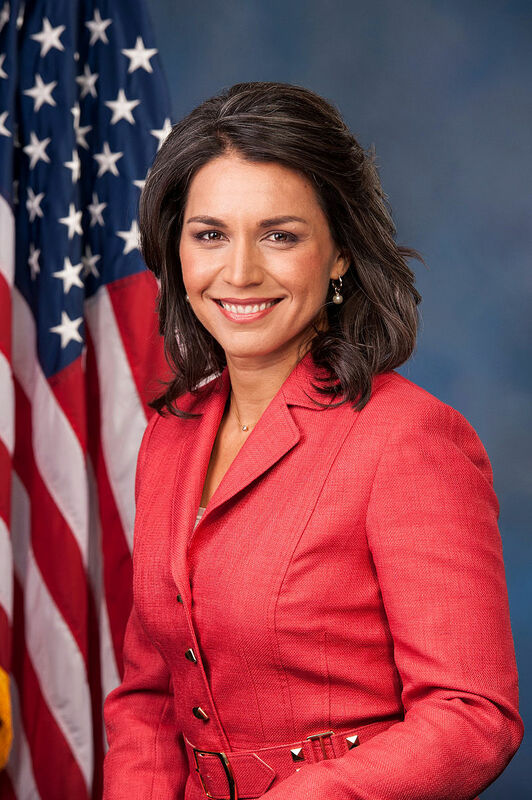 Regarding her views on gays, Tulsi announced her supporter for marriage equality in 2011 and, in 2012, she apologized for earlier homophobic statements. She issued a second apology very recently. The Human Rights Campaign endorsed her in 2016 and gave her a 100 rating. Establishment Democrats are also putting the worst possible spin on Gabbard’s contacts with Modi despite having ignored both 1) the Clintons’ warm meeting with the Indian head of state when he visited New York in 2014 and 2) Barack Obama’s visit to the head of state in December 2017 when the former President was visiting India. Many progressives consider Tulsi’s actions in 2016 and her statement in 2017 to have been heroic. She was one of the earliest elected Democrats to back Bernie Sanders publicly. In so doing and speaking truth to the powerful and corrupt DNC, she sacrificed her status as a rising star among the Democratic establishment. 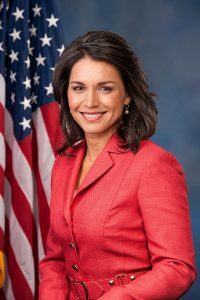 Despite Tulsi’s past problematic statements on drones and torture, many on the left view her as a foreign policy star. She separated herself forcibly from the White House and the then ascendant neoconservative ideology in 2013 when she criticized President Obama’s call for military strikes against Syria. In 2015, she rebutted forcefully Hillary Clinton’s dubious assertion that bombing Libya and killing Muammar Gaddafi was a foreign policy success. Her insistence on a non-interventionist foreign policy jibes perfectly with progressive critiques of America’s 21st century military actions in Iraq, Afghanistan, Libya, Syria, and elsewhere. Tulsi has been reliably progressive on many economic justice issues as well. She touted Medicare-for-All long before it was fashionable among Democratic elected officials. She opposed the TPP and supports higher taxes on the wealthy. Of course the positions that endear her to the left have incensed Democratic establishment figures and centrists. As an early unabashed Sanders supporter, Tulsi often finds herself on the short list with Susan Sarandon! and Bernie himself of those responsible for Trump’s election. Likewise, her apparent eagerness to break with President Obama and Secretary of State Hillary Clinton’s foreign and domestic policies has angered Democratic elites who supported (and profited from) them. First-term New York Congresswoman Alexandria Ocasio-Cortez is involved in a similar dynamic. Nearly two years ago I wrote that the internecine war within the Democratic Party between the supporters of Hillary Clinton and Bernie Sanders had not ended and would not end until one or the other prevailed. For Clinton supporters, winning means ridding the party of democratic socialists. For Sanders supporters, victory would result in a wholehearted embrace of policies that eliminate concentrated wealth and power on the one hand and poverty on the other. Progressives are prepared to overlook troubling aspects of Tulsi Gabbard’s record because she is one of only a handful of Democrats in Congress willing to expose the Democratic Party’s ongoing betrayal of America’s poor, struggling families, workers, and those dropping from the ranks of the middle class. Democratic elites and moderates are trying to discredit Tulsi by exaggerating problematic details for the exact same reason. The Democrats’ civil war continues unabated. Good analysis, Hal. I feel better about Tulsi Gabbard. She seems to have matured. Thanks Arlen and Daniel. Tulsi is not my favorite. I’m especially bothered by her anti Syrian refugee vote. She’s in my second tier after a Sanders and Warren. Tulsi and Harris are pretty much tied in my mind, although they’re more different than alike.